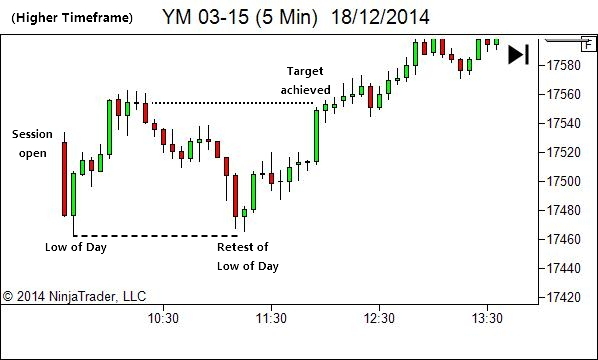 One thing I love to do over the Christmas & New Year break is to schedule a couple of days for Market Replay learning. Last Sunday & Monday were scheduled for my replay sessions. The ability to speed up the market data in-between key decision making areas means that I can squeeze in half a dozen sessions over a two day period, rather than just one a day. This is an opportunity for me to address areas of my trading that have underperformed during the previous year, and to experiment with slight tweaks to my trade execution and management style. One area of underperformance I've identified is the fact that I'm leaving a lot of potential profit on the table whenever gifted a structural trade. My trade management style has drifted over the last couple of years towards having less patience with trades (quicker to close out). This works fine when the environment supports earlier exits. But for a structural trade that offers a much larger than usual potential return, it means I'm leaving a lot on the table if I can't or don't get back in on a subsequent entry. 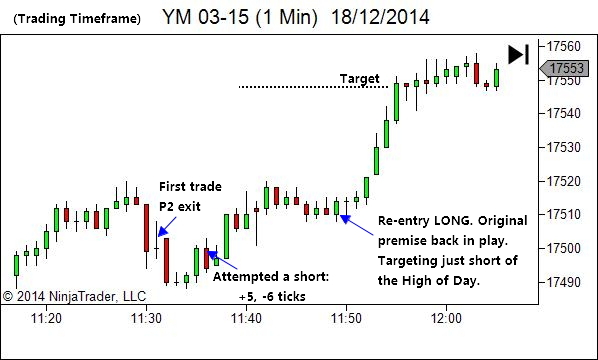 When identifying a trade in a structural location, I will be aiming for more patience with my trade management. This will involve slightly longer time-stop. And a wider trailing-stop. The key difference though is in mindset; the biggest challenge for me will be keeping my hands off the trade. What do I mean by good structural locations? Essentially, I call it a structural trade when the entry and targets are based upon key higher timeframe market structure features. This would be areas such as the Prior Day's High or Low, or the current High of Day or Low of Day. Our aim would be to hold at least a partial position from one of these locations to another. Let's look at an example from one of my replay sessions. These sessions were in the emini's rather than Crude Oil, so I was not completely familiar with the outcome (it's important to make replay as realistic as possible). 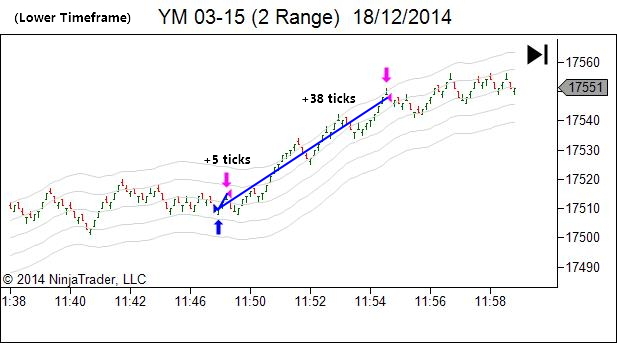 The following charts will step us through the trade location, entry and management decisions for one of these trades. I like this one as it wasn't a smooth path to the target and involved an exit and subsequent re-entry. As mentioned, I call it a structural trade when the entry and targets are based upon key higher timeframe market structure features. 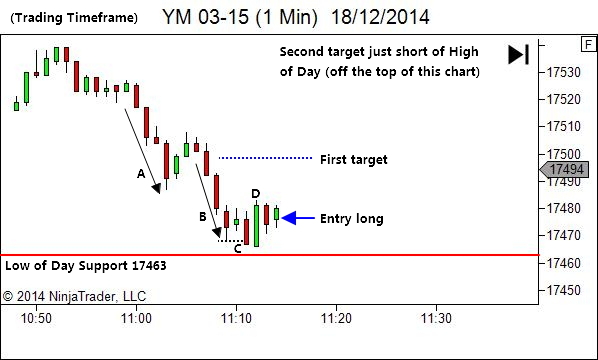 In this case entry in the vicinity of the current Low of Day, targeting the High of Day. Let's look at the entry. 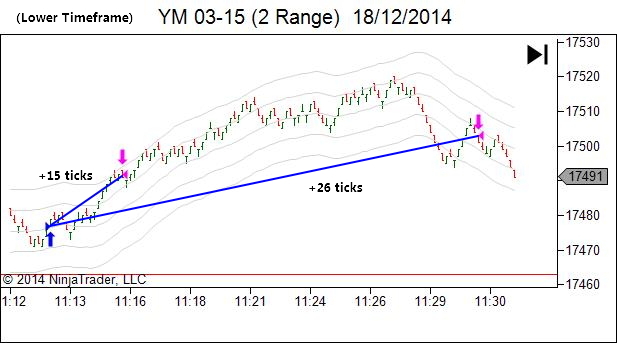 The chart above shows price moving into the "Low of Day" support via strong bearish price swings A and B. My preference at this point would be for a break of the level, looking then for either a Breakout Failure (long) or Breakout Pullback (short) trade. We didn't get either though. At C, price broke the low of swing B by only two ticks before being smashed back higher on bar D. This failure to continue short followed by strength in the bullish direction had me interested in entering long in expectation of a TST setup just above the support level. Entry was gained on a weaker pullback into support. The lower timeframe below shows the entry as it appears on the 2-Range chart, and the subsequent smooth rally to the first target (profits taken just short of the first target as the market suggested a stall). The remainder of the position was held open, with the stop at breakeven, in an attempt to capture an outlier profit should price move to retest the High of Day. Now, here's the interesting thing. Being that I prefer an Active Trade Management style, the fact that I am trying to hold a partial position for a structural outlier profit, does not mean that I'll hold it all the way to a breakeven stop-out if price movement no longer supports the premise. The Trading Timeframe chart below shows the price action that led me to closing out the remainder of the trade, well short of the target. Note the significant bearish strength in candle E. Observing this I expected a good likelihood that the market would retest the lows, so worked on exit on the next pop higher. The move lower was a trap though. 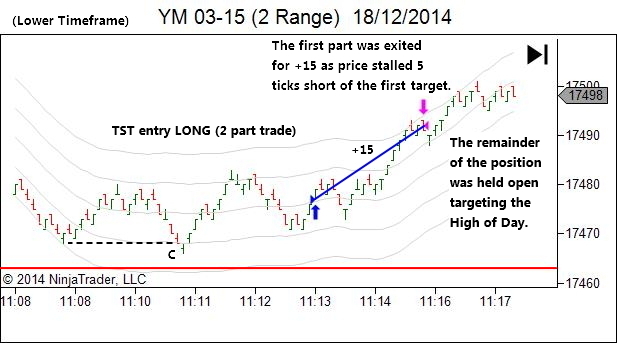 As we see below, price allowed a re-entry LONG before moving smoothly to achieve the original target. A "Structural Trade" is one I define as occurring at key market structure locations, offering the potential for larger-than-usual directional moves. 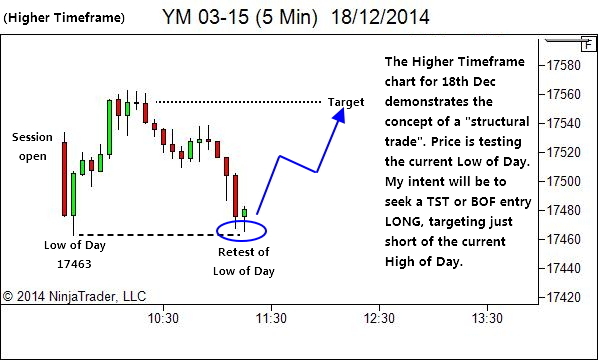 In this case, as we look again at the higher timeframe chart below, a test of the current Low of Day was identified as a potential structural trade, targeting the High of the Day. This allowed me a slight change in mindset as I attempted to hold through the swings with a little more patience than usual, leading to a very nice outlier profit. My aim during replay sessions was to make them as realistic as possible. But we all know that it's not perfect. My decisions and actions may well have been different in a live market situation. But that's not the point of the article. (b) My observation that my trade management has drifted over the last couple of years to the point that I rarely hold part two till it achieves the better structural targets. I hope to address that by identifying those trades in key structural locations that may warrant more patience, and trading them with a different "mindset". 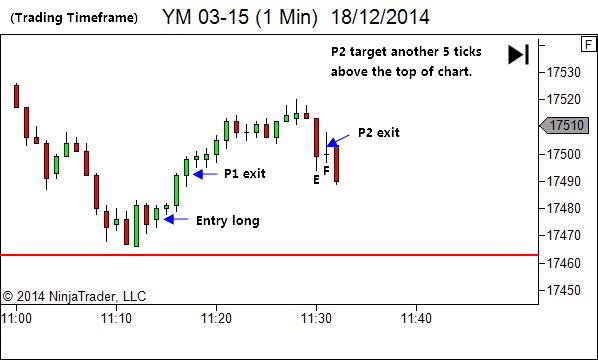 If you're not using a replay tool, consider whether or not there is a need for it in your own trading business. If you're also taking profits too soon, consider whether or not there is scope to also work on lengthening your hold. Perhaps you too might wish to start with those trades in key structural locations?